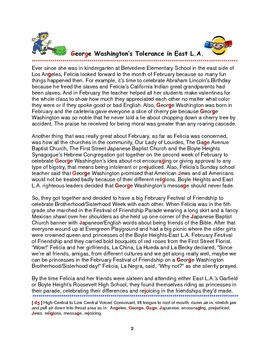 “Tolerance Stories: George Washington’s Festival of Friendship in East L.A.,” written by Norma Landa Flores, M.A. 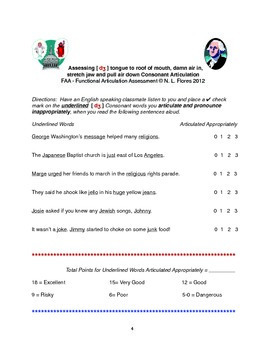 Speech Communication, is available on digital download at: teacherspayteachers.com, It is a 10 page Oral Communication and Pronunciation Lesson that features the story/poem entitled, “George Washington’s Tolerance in East L.A. ” on page 2 plus directions of how to articulate the consonant [ dʒ ] as in George. Page 3 contains “Multiple Choice Questions for Discussion,Including Student’s Values.” Page 4 is the [ dʒ ] tongue to roof of mouth, damn air in, stretch jaw and pull air down Consonant Articulation Assessment form, consisting of 6 sentences containing the consonant [ dʒ ] with which students may take turns pronouncing and assessing each other. Pages 7-10, is the Appendix with Suggestions for the Teacher/Facilitator to more easily teach an oral communication lesson creating relevancy due to the “Brotherhood/Sisterhood Tolerance” and “George Washington in East L.A.” theme of this lesson that served as the “Intercultural Friendship” concept for Boyle Heights and E.L.A.’s Festival of Friendship held at Fresno Park in East Los Angeles. This material is suitable for students in grades 5-8 and above. In addition, the content is very helpful for any age level student learning English as a Second Language or for Special Education students having difficulty articulating [ dʒ ] or substituting [ tʃ ] [ ʃ ] or [ j ] for this sound. 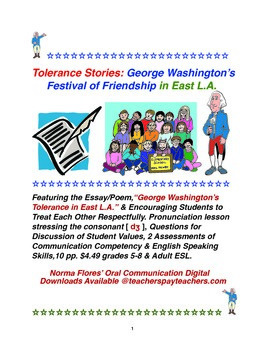 “Tolerance Stories: George Washington’s Festival of Friendship in East L.A.,” encourages verbal communication, cooperation and oral collaboration. A wonderful bonus is that this story serves as a sample for writing a short story bilingually & multiculturally, improving and assessing articulation plus role-modeling storytelling/problem-solution outlining skills too! In this short story we learn that friendship can last throughout elementary school and up to high school when students have wise governmental, educational and community role models to follow in treating each other tolerantly because of race, gender or religious differences. Thanks to George Washington, you can have a very happy Brotherhood/Sisterhood Day in your school, place of worship and neighborhood too!